There were a lot of errors witnessed at the Mashujaa Day celebrations in Kakamega county. The sound providers were a disappointment even the President who seemed to be enjoying the song from 13 year old Leyla Mohamed. President Uhuru openly expressed his disappointment as the sound kept going off during the girl’s inaugural performance of the classic ‘Wimbo wa Historia’ in her own rendition. #MashujaaDay2018 the sound guy is a mess. He should be demoted. Am so annoyed with that sound man!!! How could he do that to Leyla ! 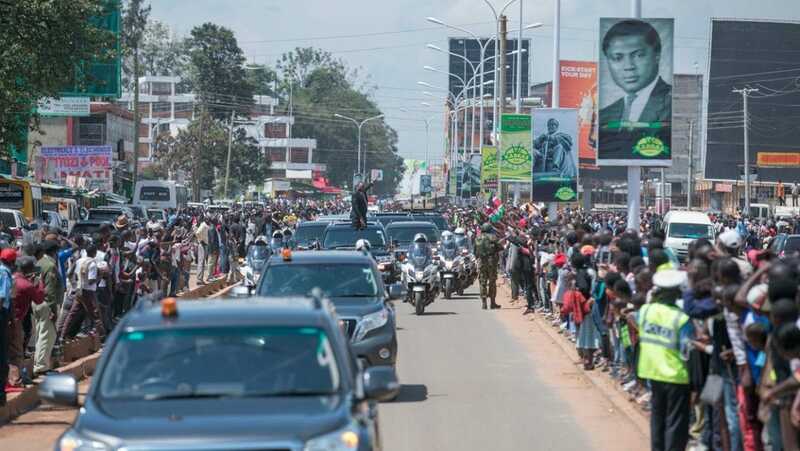 In another incident the driver ferrying the president was not aware of the happenings and surroundings after the president alighted and endangered the life of senior arm officials as well as one of the on lookers. The stadium was filled beyond the 5000 capacity but residents were allowed to sit of the football pitch to allow them to follow the proceedings of Mashujaa day. Next article Raila Appointed As High Representative for Infrastructure Development in Africa. Raila Appointed As High Representative for Infrastructure Development in Africa.